Last weekend could have been a great one for bicycling. Both the RSVP (Ride from Seattle to Vancouver and Party!) and Obliteride rides took place, but I took a pass on both. RSVP would have been fantastic, but I couldn’t find a riding partner to share the logistics. Obliteride, a ride for a great cause (cancer research), was simply too expensive. 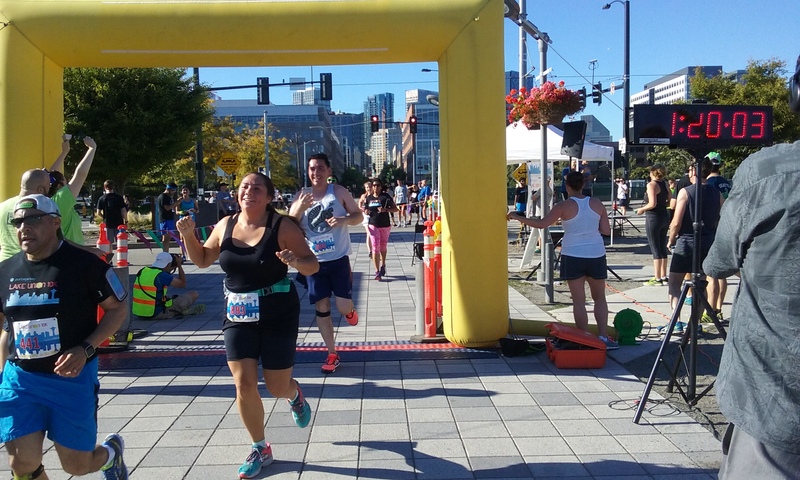 So instead, I ran the Lake Union 10K on Sunday (Aug. 14), a race I’d never done before. 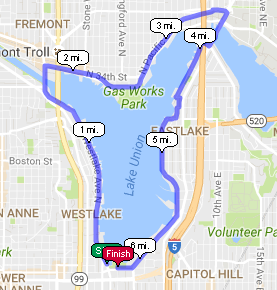 I’m glad I did, because the course is a breezy run around the lake, through Fremont and the edge of the University of Washington campus. It starts and ends at the very well-groomed Lake Union Park near downtown Seattle. 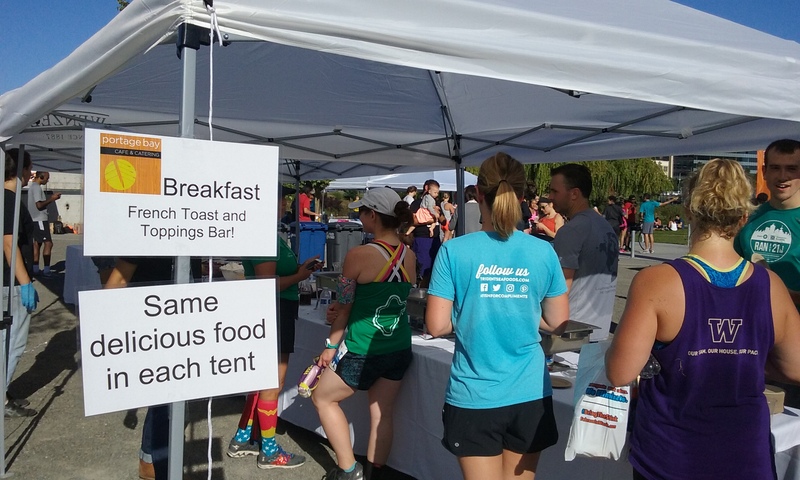 Also, the organizers, Portage Bay Café and 5focus, provide a post-race breakfast of eggs, French toast, strawberry shortcake, fruit and other goodies. Moreover, the event benefits the Puget Sound chapter of Girls on the Run, and has a strong health and fitness vibe. 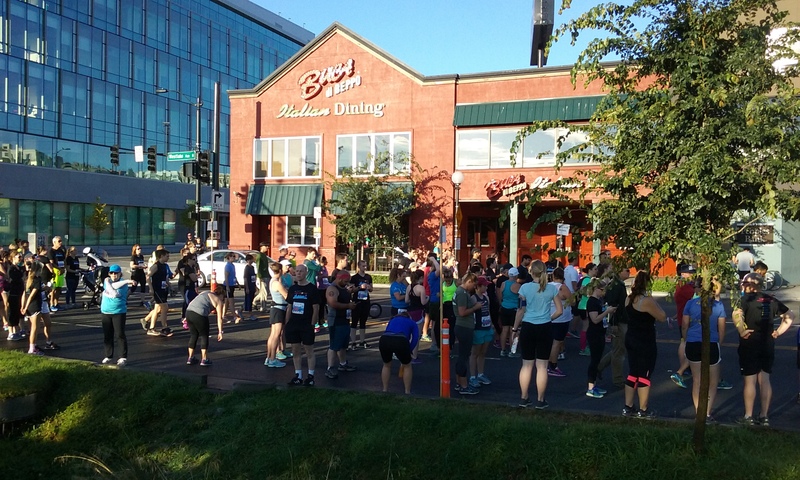 Some 1,255 runners and walkers completed the 6.2-mile loop, including several teams from the nearby Amazon.com headquarters in south Lake Union. This race took place on an 80-degree day, but it was early enough (7:30 a.m. start) to miss the serious heat. Bottom line, I will probably run it again. I can’t say the course is perfect. I imagined it being one that actually touched the edge of the lake. Instead, it looped around Lake Union more loosely on streets and trails, and did not offer many breathtaking views. But I still enjoyed the jaunt north up a wide-open Westlake Avenue, across the Fremont Bridge, and through trendy Fremont on the Burke-Gilman Trail. You then cross the University Bridge on a narrow path that doesn’t accommodate runners and strollers side-by-side. A tight squeeze, but I made it. The way back to Lake Union Park on the lake’s eastside is anything but straight as you weave through neighborhoods and businesses, and don’t often see the lake. It was fine, because you avoided cars. I really liked the last, sidewalk stretch along Valley Street on the south end and the straightaway to the finish line. I finished in 1:17:54, a 12:33 per mile pace. Full results are here. This was a tad slower than the 1:17:10 I ran at last year’s Seattle Marathon 10K, but better than any other of my post-surgery 10K times. My 10K PR is 51:44 in 2004, and I’m happy to say that a majority of my 10K race times are still under an hour. One other point: Though I talked about the post-race breakfast, I did not partake in it. The food looked great, but the lines were just too long, and I wasn’t all that hungry after the race. If you’re reading this and you did have some food, please leave a comment. Congrats to Facebook friend Joyce Szymanski for her fine race. I didn’t see her or anyone else I knew at the race, but many people milled around Lake Union Park afterwards — largely because of the breakfast, but also because of the sun and fun vibe. I’m running another 10K, the Seattle Marathon 10K, on August 27. Then on Labor Day, I am doing the Overlake Medical Center Labor Day Half-Marathon beginning at Marymoor Park. The latter will be my 38th half-marathon and my 200th race overall (since 2001). 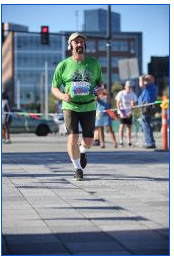 It will also be my 63rd race since my ankle surgery five years ago this month, when I thought I would never run again. Looking forward to the finish line. 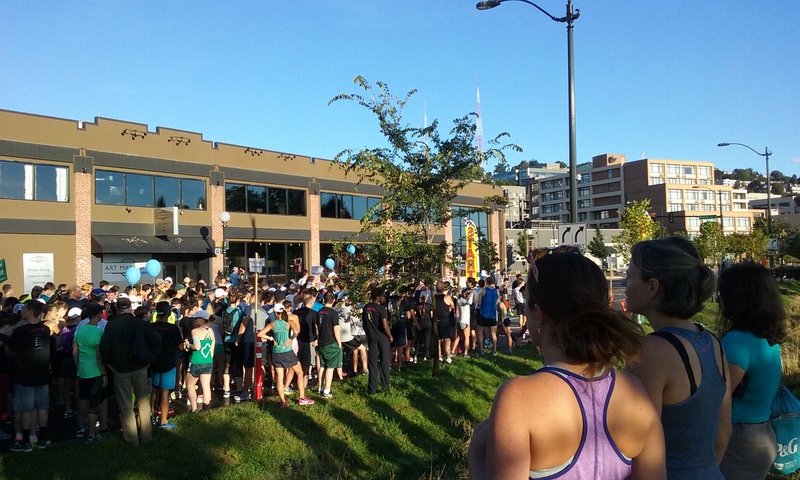 This entry was posted in 10K, Bicycling, Burke-Gilman Trail, RSVP, Running, Seattle Marathon and tagged ankle surgery, Bicycling, Burke-Gilman Trail, Half-Marathons, Labor Day Half-Marathon, Lake Union 10K, Marymoor Park, Running, Seattle Marathon. Bookmark the permalink.